Yesterday I said the tennis team was finally looking healthy and motivated. After last night, you can add determined to that description. With the match tied at 3 courts a piece, Jamie Hunt (pictured) must have known the whole thing was in his hands. Hunt absolutely destroyed UVa's Sanam Singh in the biggest third set of the year. The Dawgs beat #1 seed and previously undefeated UVa 4-3 with Hunt's dominating 6-0 third set. I don't know if Singh was hurt or was cramping up, but it was an ugly display as Hunt kept hitting winners and Singh kept hanging his head. Hunt, a sophomore from San Antonio, came up huge. So now the Dawgs go for the NCAA title tonight in Tulsa. 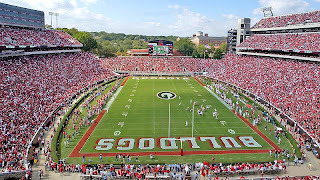 Georgia has never won the whole thing away from Athens. They'll face an equally hot Texas team, who has upset #2 Ohio State and #3 UCLA to earn a spot in tonight's final. The Dawgs beat the Horns 4-2 earlier this year at the national indoor championships. It was a tight match, but Luis Flores didn't play. Flores is back in the lineup and is looking really, really good. He won last night 6-2, 6-1. The Horns and the Dawgs have some history here. Coach Diaz and Texas coach Michael Center were once close friends. When Travis Helgeson transferred from Texas to Georgia after being named Big 12 Player of the Year, coach Center made some accusations toward Coach Diaz. I admit I don't know the whole story, but I know Center and Diaz aren't on good terms over it. Tonight's match airs on ESPNU at 7:00 PM Eastern. Dead-on Quinton regarding Jamie Hunt's play last night in his match. This kid is the MVP of this team this season. Plays with a ton of heart, has played wherever the team needs him all year long and has done nothing but win everywhere. The UVA player was cramping badly last night but Coach Diaz has the most rigorous conditioning program around which plays just as much a role in these matches on back to back to back days. Re: the earlier match against Texas this season, Helgeson had an aching achilles, Schnugg had the flu all tourney and found a way to keep playing (barely), and Luis was out with a broken foot. Still won 4-2. As long as there is no let-down factor from last night (which I doubt), GA wins 4-1 this evening. No one is beating Luis, Nate, and Javier the way they're playing now. Also right about the TX coach having a strong disdain for our program. 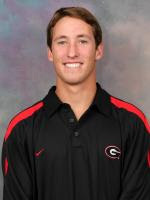 For some unknown reason, there have been several high-line players x-fer from TX to UGA over the years and have wound up being some our better players. Their Coach is just fed up with it. Our line 1 guys Travis Helgeson is the latest to come to GA via Univ of TX. He will see he made the right choice yet again tonight. Thanks for your reporting of the tennis teams success. Coach McGill started this great 50+ year run, and Coach Diaze brought it to new heights. What a great program. Look in the record books to see how many SEC championships the DAWGS have won. It must be approaching 30. Speaking of country club sports, what happened to the golf team? Going into Saturday, they were out in front of the pack. The golf team blew away the field at the East regional. They'll play in the championship round May 28-31. Jamie Hunt and Kenneth Parcel from 30Rock. Lost the doubles point and the first singles point but rattled off four straight singles wins to take the title, 4-2.